Project obstacles and solutions: As part of the Ohio River Bridges Project, two tunnels were cut out of bedrock to connect I-265 on either side of the Ohio River in Louisville, Kentucky. The highway angles down to approach the tunnel openings, which are 70 feet below the surrounding terrain. To enhance the aesthetics of the new tunnels, the artisan group, Boulderscape, was hired to apply a natural-looking stone finish to the walls. IMI had supplied shotcrete to secure the exposed walls as the bedrock was blasted away for the new highway. Boulderscape used a finished shotcrete that was pneumatically sprayed onto the blasted cliff walls of the tunnel approach areas. This shotcrete was colored and hand troweled to look like weathered stone cliffs on the side walls. The photos on the right show the detail of Boulderscape's work, including building fissures into the cliff areas. The walls above the tunnel openings were also coated with colored shotcrete and then troweled to simulate stacked, cut stone. The look is so real, even at close proximity, it is hard to see that the walls are actually just a veneer of finished shotcrete. 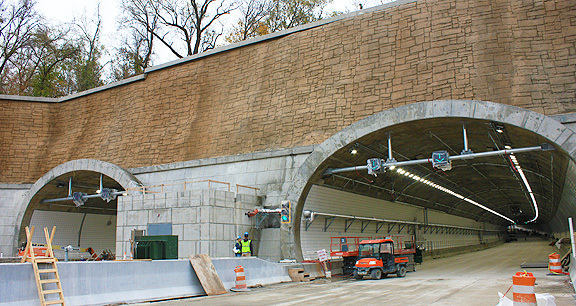 IMI supplied 5,000 yards of shotcrete for the exterior walls of the north and south tunnel approaches for this project. The new tunnels opened for traffic on December 17, 2016. For more information on using shotcrete in construction, contact the sales representative for the concrete plant nearest your location. Click here.